Who said making your own lunches is easy and is also cheaper than buying the ready-made stuff? Yes I agree, it may be cheaper , and you know exactly what lurks among your salad leaves if you make it yourself. But how do we keep the lunch ideas going? Nine months into my office job and I am out. Completely out of ideas. I have done the sandwiches, the salads, the soups and now what? As the picture above will tell you, I have resorted to the ready-made stuff. 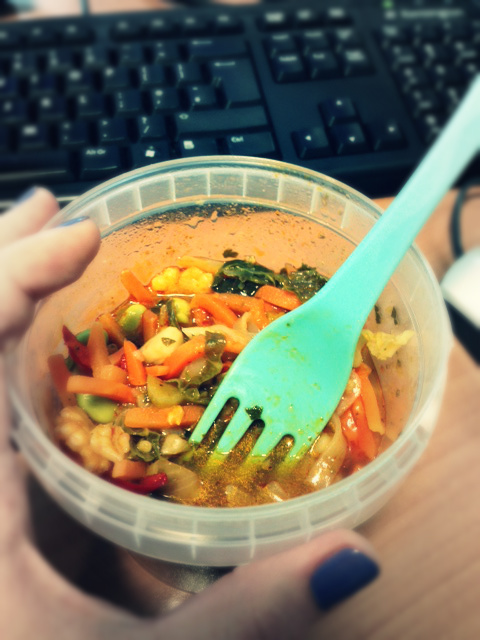 In this case it was an Innocent Veggie pot, which is one of the better choices out there with only 239 calories for the Thai Tom Yum. Stick a yogurt on the end of that lunch and you’re looking at about 350 calories for a very filling lunch, fantastic. But not everyone, and me especially can afford to buy these babies every day. What’s your secret weapon for when you’re out of lunch ideas? Innocent is my saviour, but I need to get out of the habit of buying them so often. Time to stop being lazy! This entry was posted in Uncategorized and tagged calories, diet, food, innocent, lunch on March 17, 2014 by hellotummy.